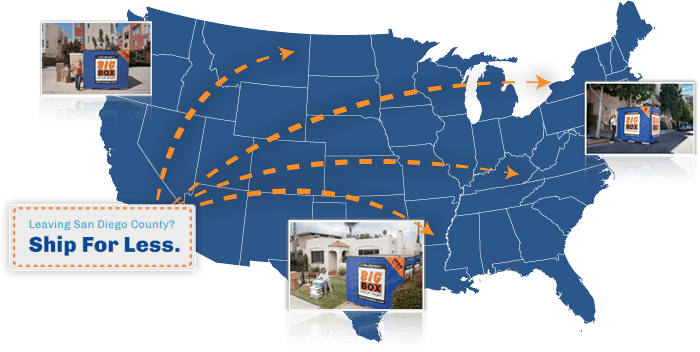 More than just a great storage company, Big Box Storage also offers customers the ability to have their rented Big Boxes shipped to any metro area in the U.S. and then re-delivered right to their new address within the area. In addition to the convenience of the door-to-door delivery and pickup service, customers also enjoy extremely aggressive shipping rates, which include free local delivery and pickup in San Diego, 30 days of free storage, and the shipping to their new destination city. Whether you’re headed to Seattle, Boston, Miami, or any U.S. city/town in between, let Big Box Storage coordinate the storage and transport of your valued items. To see just how much you can actually save on an upcoming long distance shipment, please visit the shipping rates page or contact a Big Box Storage representative at 800-391-4890.